Designed as simple as possible, WinCam is packed with functions that allow for almost any use: recording video tutorials, saving Skype calls, capturing various media in real time and creating visual content in a hit of a button. Choose the desired video source and effects, click the Record button and proceed as usual: work in any application, watch video or play games. When you’re done, click WinCam icon or press a hotkey, and the video of your activity is ready for sharing. WinCam incorporates the same design philosophy as WinSnap (our screenshot creator). On the right pane, you can adjust the video source, the frame rate and post-processing effects, and preview these changes immediately without starting recording. Creating a tutorial, you can make your cursor pop by adjusting its size, adding the highlight effect and mouse click animations. Alternatively, when recording a live-stream video, you might want to hide the distacting cursor entirely. It’s your preference! In WinCam, it’s a quick option you can adjust in a few clicks. With WinCam, you can record system audio, microphone or both simultaneously. The selected audio signals are automatically resampled to achieve the best possible quality, mixed together and encoded in real time alongside the video. 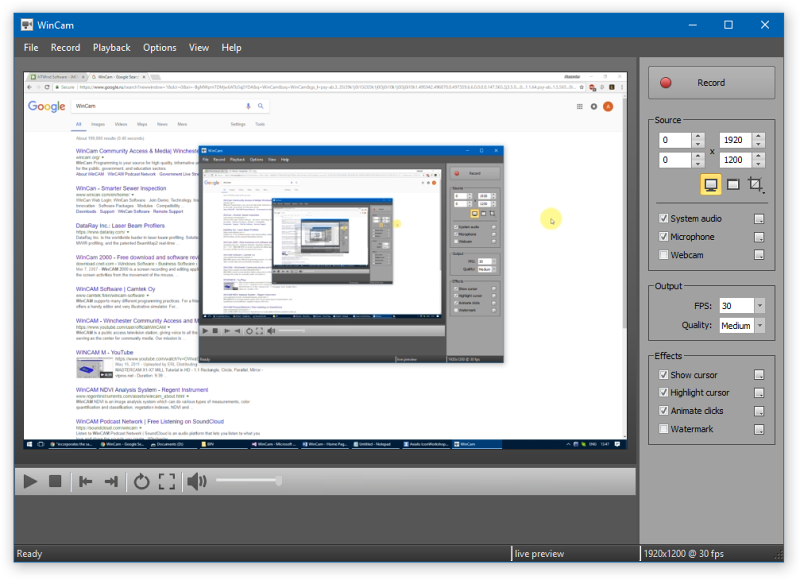 When recording is done, you can preview it and do some basic editing directly in WinCam. Double-click the timeline or use the corresponding toolbar buttons to set the start and end times of the video. Then click the Save button to save your clip as a copy or overwrite the original video. It becomes very useful since almost every screen recording contains unnecessary parts when you are setting up the environment or switch to WinCam to stop recording. Stripped from anything beyond screen recording, WinCam brings this one function to perfection. Less talk, more action: hit the hotkey and start recording the screen the next minute after you download WinCam. No other software is THAT easy! WinCam runs only on Windows 10 and 8, older versions of Windows are not supported. Native 64-bit executables are included in the setup package and installed automatically.